Chanteur Rockabilly US né Claiborne Joseph Cheramie, le 9 Septembre 1938 à Harvey (Louisiane). Atteint par un Cancer des reins, Joe Clay est décédé le 26 Septembre 2016. 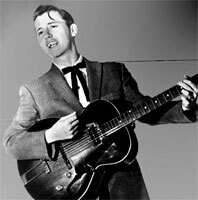 Rockabilly singer/guitarist Joe Clay was on the cusp of stardom in 1956, when he appeared on The Ed Sullivan Show at 17 and won a contract with RCA Records. 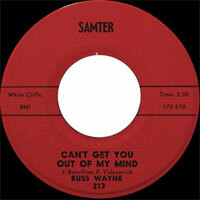 But Sullivan, in typical repressive fashion, told the young singer to play the Platters subdued "Only You" instead of his rollicking "Duck Tail," and Clay's domineering manager refused to allow him to play outside New Orleans and eventually drove RCA away. But it wasn't the last the world would hear from Joe Clay. Born in Louisiana's Cajun territory as Claiborne Joseph Cheramie, Clay began playing in a country band at 12 which went on to get a gig on WWEZ radio. 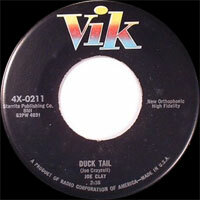 RCA created a subsidiary called Vik Records, which called the station looking for talent. The label then offered Clay a contract, to which Clay replied, "Hell yes!" Clay, who had already recorded Sixteen Chicks, Goodbye Goodbye, and You Look That Good to Me in Houston, was flown to New York, where he recorded with some of the finest black rhythm musicians of the time (guitarist Mickey Baker, guitarist Skeeter Best, bassist Leonard Gaskin, and drummers Bobby Donaldson and Joe Marshall) in one of the earlier integrated studio sessions. But the raucous music went nowhere. 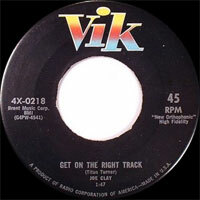 Clay played like Carl Perkins and Elvis Presley, and appeared on Sullivan months earlier than Presley, but only succeeded in playing backup on some Elvis recordings. Clay spent the next 30 years singing in the Bourbon Street lounges of New Orleans, eventually driving a bus to support himself. 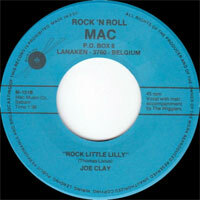 By the 1980s, after he'd given up performing, Clay was becoming a star in Europe, unbeknownst to him. A West German label issued a '50s revival album featuring Clay that took off, and a diehard English promoter spent years trying to track Clay down, placing classified ads, calling DJs, and working contacts. Willie Jeffrey finally found Clay and arranged a tour of England in 1986. Joe Clay dead September 26, 2016. 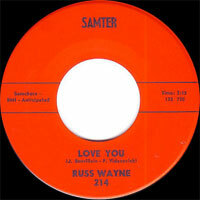 08/1962 SP SAMTER 213 (US) .